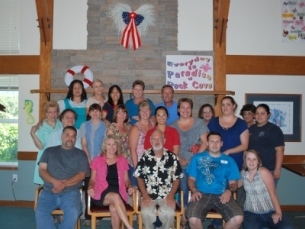 Comfort, self-direction and supportive care are the hallmarks of assisted living at Rock Cove. We offer a choice of private studio or one-bedroom apartments with the home-like amenities you’d expect, including a spacious bathroom, kitchenette, individually controlled heat and air conditioning, cable and phone access. Our apartments are specifically designed to help senior and disabled adults maintain their independence and include an easy to access emergency response system to assist residents in calling for staff help when it’s needed. Residents furnish their apartments themselves, truly making them feel like home. Even small pets are welcome! Click here to see floor plans of our private assisted living apartments. Rock Cove abounds with everyday conveniences … three homestyle meals served daily, nutritious snacks if hunger strikes between meals, routine housekeeping and laundry services, transportation coordination and an on-site beauty / barber shop. As needed assistance is available for various levels of need including personal care, medical and health monitoring, social, recreational and spiritual needs and behavioral support. Our staff is trained to respond with courteous, competent, and loving care, in a manner that maintains maximum privacy, dignity, choice and respect for resident’s abilities and preferences. We not only find out what our residents' specific needs are, we find out the manner in which we should deliver the requested services. Our assisted living community is well equipped to provide an increasing level of support as may be needed or requested, either in-house or through coordinated efforts with community service providers. From hospitality and personal care services, to health and wellness and specialty care, our range of services enable us to better provide consistent and reliable care across a broad range of needs. Click here to learn more about our services. As care needs change, our staff can work together with residents and their families whenever needed to discuss and address any additional service considerations. We may work with a wide range of health professionals including personal physicians, rehabilitation services, social workers, therapists, professionals from hospice and home health, emergency medical, and friends and family to help ensure a well coordinated holistic plan of care is delivered and that residents preferences are honored. Rock Cove offers an impressive array of activities with something for everyone. Although activity programming can vary based on current resident interests, ice-cream socials, spa days, garden clubs, movie showings, health and speciality clinics, educational classes, inter- generational programs, and special interest groups may be offered to invite social interaction and companionship as well as mental and spiritual enrichment. The grounds are designed with easy to navigate walkways to encourage wandering about in the great outdoors. There’s lots of regular outbound adventures that are culturally, spiritually and intellectually stimulating … and just plain fun! Rock Cove: Assisted Living At Its Very Best. Check Us Out!